When I first became interested in satellite TV nearly 20 years ago, it was definitely a rich man's hobby. Even an ultra-basic system comprising a rotary-tuned analogue receiver with mono sound, noisy LNB and 90cm dish sold for £500. In this pre-digital era, few channels were available and that small dish (1.2m was the general recommendation) meant that results were somewhat variable. Now hundreds of digital channels are available from just one orbital position, and hardware has never been cheaper. We live in an era where you can buy a DVD player for not much more than the price of one full-price DVD, thanks to the industrious Chinese electronics industry and its vast economies of scale. With this in mind, we shouldn't really be surprised that a complete satellite system - based on a budget Far-Eastern receiver - can be assembled for such a small amount of money. And although the receiver is hardly enthusiast-grade, it's not a toy; you wouldn't expect one from a respected brand like Technisat. 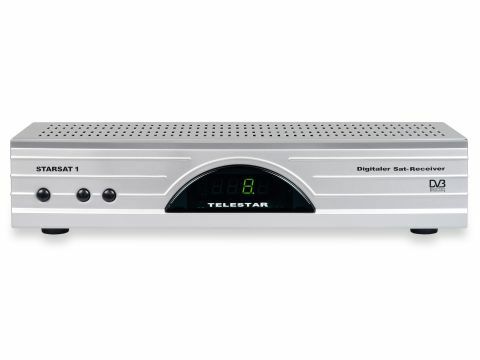 The Telestar StarSat 1 receiver may store 4,000 channels only, but that should be more than enough for an FTA-only box. Even this capacity will suffice for several popular satellites - this system may not be motorised but, thanks to its DiSEqC 1.2 and USALS capacity, the opportunity to upgrade is always there. There's even an optical digital audio output, which is most unexpected at this level. The dish is 80cm in size, and the supplied 'SkySingle 40' single-output wideband LNB - which has a claimed noise figure of 0.6dB - should be sufficient to pull in all of the most important satellites that can be received in Europe. An 80cm dish lends itself to motorisation; hopefully, Technisat will source a cheap DiSEqC mount for use with it. Some comprehensive self-install instructions (perhaps published on a website to keep costs down) would enable DIY enthusiasts to put it all together and enjoy the fascinating televisual choice that is available from the skies. The cheapest mount I could find sells for £60, in other words, £10 less than the entire system reviewed here. A tiny box that's less than 140mm deep, the StarSat 1 certainly won't win any awards for fancy styling. But in practical terms it fares better. Most obviously, there's a four-digit green LED display for indicating channel number. Great, then, for radio-only listening - as is the aforementioned rear-mounted optical digital audio output. Front panel controls are restricted to channel up/down and standby; the utilitarian handset is a must. Around the back, there's no UHF modulator, so a TV with Scart is essential. Telestar has endowed the StarSat 1 with a RS232 serial port for upgrades, although one upgrade that's certainly not possible is a path to conditional-access - the StarSat 1 is resolutely a FTA-only receiver. A peek inside reveals acceptable build quality, and some good-quality components, including the familiar STi5518 'jungle-chip' DVB/MPEG-2 decoder, an ALPS tuner and a Burr-Brown audio DAC. Components like this can be found in vastly more expensive receivers. The main menu is split into five main sections, including a 'channel-manager' (for listing/renaming/locking/moving channels or managing six 'favourites' lists - three TV, and three radio), 'receiver information' (hardware and firmware versions) and timer (10 events, over a year). Perhaps the most important one, though, is 'user installation'. In here are all of the functions involved with setting up the receiver - dish/LNB/DiSEqC setup, channel- searching, system (languages, aspect ratio, video output/ standard and LNB power), over-the-air firmware and database updates (these are carried via Astra 1, although none was available when I tried), parental locks and the ability to load factory-default settings. From the channel-search menu, you can choose the satellite to be searched and specify a network scan, one or all transponders. The coloured buttons bring up pertinent submenus (a theme that's common throughout the StarSat 1's user interface). In channel search, for example, pressing the red button will let you edit transponder details like frequency, polarisation and symbol rate. Press the green button, and manual PID entry is on the cards - the yellow button, meanwhile, presents you with the opportunity to rename the satellite. Those folk with DiSEqC can move their dishes and store satellite positions - other available multi- sat options (which have to be changed from 'antenna setup') include Skywire, Unicable and DiSEqC 1.0 switchboxes. Signal-strength and quality bar graphs pertaining to a user-selectable transponder on that satellite are displayed as a positioning aid. If you're using a USALS dish mount, site latitude and longitude can be entered for automatic determination of satellite positions - a 'go-to' function will let you enter the orbital position of the bird you're after. There's also a 'resync' function that will apply the same correction to all satellite positions. Owing to limited memory capacity, the StarSat 1 will store 16 satellite positions only. But that's more than we have any right to expect from a receiver that's intended for use with fixed dishes. In any case, 16 is sufficient for most applications! A nice touch in the antenna setup submenu is 'antenna direction help', an azimuth/elevation calculator that's accessed by pressing the blue button. This could be useful when installing the dish that forms part of the package. Simply choose the satellite, enter your longitude and latitude, and the receiver displays the angles to which the dish should be set. Channel-finding functionality is very basic - there's no blind-search, but then again this receiver is not pitched at dedicated enthusiasts. Searches will only find FTA channels but, then again, there's little point wasting precious channel memory on encrypted services that can't be received! Pressing 'enter' displays the channel list. This is somewhat primitive by today's standards; there's no alphabetic search, for example. You can scroll through the list page by page, and there's a nifty 'last channel viewed' function. If you've motorised your dish, pressing the remote's 'sat' button will switch between the channel databases of each satellite. Teletext is supported, the unit having its own decoder on-board. The EPG supports both now-and-next and seven- day schedules. Unfortunately, ours proved to be somewhat erratic. Sometimes it would display data from channels with comprehensive EPGs (the German ones on Astra 1, for example). On other occasions all we got was a 'no information yet' message. The timer cannot be programmed directly from the EPG - all of the parameters have to be entered manually. The STi5518 supports various gimmicks which are not available on the StarSat 1, but the StarSat 1 will convert PAL channels into NTSC (or vice versa), depending on the 'TV Type' menu setting. Those who've upgraded to DiSEqC can quickly peak their dishes, thanks to a dedicated positioner 'shortcut' handset button. A nice feature can be found in the 'programme information' screen that's accessed by pressing the remote's 'info' button. From here, you can enter audio, video and PCR PIDs. This is particularly useful for radio listening, because their audio PIDs change on occasion. The off set-type dish is of necessarily inexpensive construction, and is easy to piece together. Its core component is an 80cm reflector formed from lightweight pressed steel. To this bolts the LNB boom and mounting bracket. Thanks to a three-bolt arrangement, the dish can be swivelled up and down to facilitate elevation adjustment. A scale has been embossed on the bracket, but it hasn't been calibrated. U-bolts and a pair of clamps attach the bracket to a pole, which can be up to 2in. (50mm) in diameter. Azimuth adjustment is achieved by rotating the dish on the mounting pole. Alignment is not as easy as it could be; until all of the bolts are tightened (which restricts movement) there's a fair amount of unwanted play. However, that's not to say it's impossible. The LNB fits to a clamp, which is itself rather fiddly to put together, courtesy of some tiny screws and nuts. Note that you can't pass the LNB cable through the boom as you can with some designs. The LNB has lightly coloured casework (presumably to reflect rather than absorb sunlight) and is supplied with a weatherproof 'boot' to cover the 'F' connector. No connectors or co-ax are supplied. These can be obtained from satellite retailers or electronics chains like Maplin. Thanks to the StarSat 1's core ST chipset, picture quality can match vastly more expensive receivers - especially via RGB Scart. Colours from decent-quality channels are vibrant, and plenty of detail is evident; sadly, artefacts like macro-blocking plague lower-bitrate channels. Sound quality is impressive from both analogue and digital outputs, and its full potential will be realised with a decent audio system. Channel selection is rather slow; you're advised to place frequently watched channels in one of the favourites lists. Searches are similarly sluggish; a scan of the receiver's 90 preset Hot Bird transponders takes over seven minutes. With the supplied dish and LNB, the system was able to reliably pull in channels from both major Astra clusters, Hot Bird and Eutelsat W2 from the South-East Essex test location. But unless you motorise, you'll have to realign the dish every time a new bird is desired! It may not be perfect, but this system represents extraordinary value for money. All the essential features are present, and AV quality exceeds expectations. Technisat could have a winner here, although it's difficult to see how it can actually make any money! The system will appeal to migrant workers wanting to view TV from home, enthusiasts on a budget and even schools.